Fully lockable for security, this eight drawer tool chest is ideal for storing and carrying a whole array of tools. Fitted with two 50x590mm drawers and six 50x194mm drawers, all featuring a ball bearing slide mechanism, the topmost set of drawers can be accessed via the flip-top lid as well as by pulling the drawers out, extending the range of items they can store, and each drawer is supplied with matting to protect your expensive equipment. 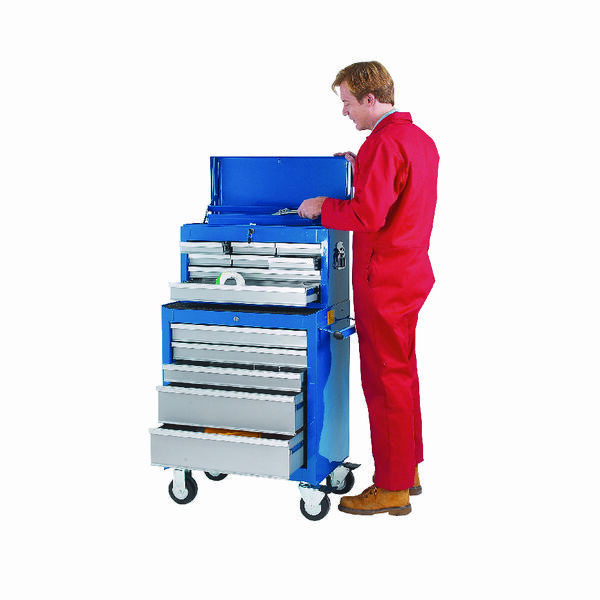 Supplied in a striking blue powder coated finish, the chest has a carrying handle on each side, making it ideal for both mobile and workshop based jobs.